The BME Global Pharma Congress, which brought together industry experts and thought leaders from the healthcare supply chain, impressed me with the amount of different keynotes, panel discussions and premium speakers. 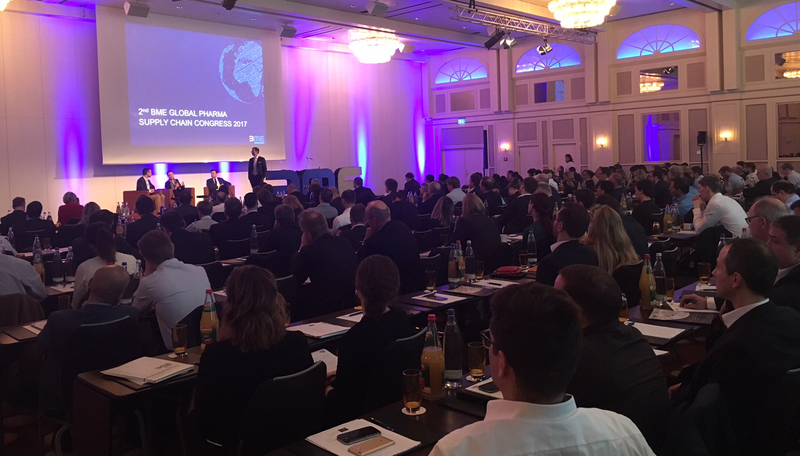 Throughout the four day conference in Frankfurt (Germany), the main question analyzed was how to close gaps in pharma supply chains, from large international corporations, producers and retailers to pharmacies and hospitals, with the help of digitalization. During the course of this event, the following topics became fundamental: the integrated view of the entire value chain, the concept of “end-to-end” supply chain management, Supply Chain Control Towers and the centricity of patients. Alessandro de Luca, CIO of Merck Healthcare & SVP to Global Supply and Network Operations at Merck Group is responsible for the end-to-end supply chain at Merck Biopharma. In 2016, his division gave him the honor of “Inspirational Leader of the Year.” He opened the congress with a demonstration of the digital supply chain journey and a vision for a holistic Control Tower. In his presentation, he defined three phases of digital processes: descriptive, predictive and prescriptive. The descriptive phase records existing data to describe real-time performance. The following predictive phase combines machine-learning, forecasting and predictive modelling for demand to anticipate actions. The last phase determines what solution should be undertaken, so is therefore prescriptive. In this phase, Artificial Intelligence is used to power analyses and advise on supply chain design and operative performance. In the vision presented by Merck, while passing through these phases, managers for example receive key figures and critical situations in real-time as a voice mail on their mobile phone every morning. Immediately, they can react and, for example, boost a production in a plant in France to fit an order in the Hungarian plant. Compared to often rigid and analogue standards in today’s supply chains, this journey gave the impression of how digital change will continue to influence supply chain management in the pharma industry. Despite these technological developments in common supply chain processes, Dr. Silvius Grobosch, CEO of BME e.V. affirmed that the patient must always be at the center of all processes. 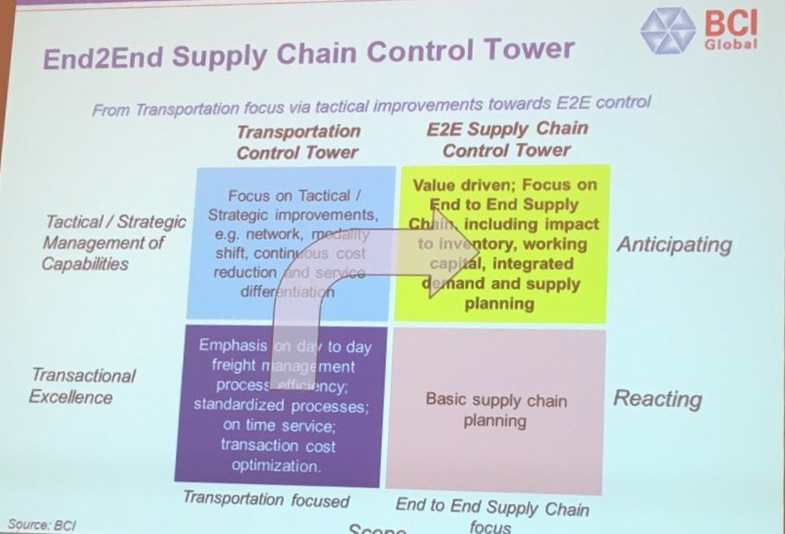 On the last day of the conference, the recurring theme – “Control Towers for the end-to-end supply chain” – caught my attention again. BCI, an organization carrying out research for supply chain strategy, presented the goals and values of this concept. A Control Tower collects real-time data from the fields of transportation, suppliers, production, inventory and customers. It offers improved visibility and an in-depth understanding of changing circumstances. In their understanding and looking at the graph above, real-time control of processes leads managers from Transactional Excellence to Anticipation. This means the entire supply chain becomes value-driven, not just transportation. Therefore, impacts to inventory, working capital and integrated demand must all be considered to reach this ‘Anticipation’ focus in the end-to-end supply chain. This concept is something many firms in attendance are striving to accomplish, but the integration process and getting everyone on board will certainly take a lot of time and effort. An extreme change in processes resulting from the abovementioned digitalization, shows the need to upgrade the skills of people in supply chain management in order to avoid job losses. Therefore, demand planners must become demand architects and analyze the latest technology in order to achieve maximum performance. Furthermore, the key role of a supply chain manager in the pharma industry will be to establish “access to medicine.” Adequate treatment for every patient is a goal that can only be achieved by connecting people, not only in Europe but worldwide. Therefore, internationality was a big focus at the congress. The conference organizer, BME, strives to support the pharma and healthcare industries in crisis regions by creating a global platform for important players responsible for patient care. “end-to-end” supply chain is not a buzzword but a highly relevant term in the pharma industry. It is about mapping a continuous information flow without any media disruptions, from purchasing down to the patient. “The measure is minute.” – Time is an extremely sensitive factor, particularly in the supply of medicine. Therefore, real-time data has to be considered. But: as pharma products are liable to a lot of regulations such as sterile treatment and proof of effects, processes often are slow and in some stages of the supply chain, real time data is redundant. Compared to other industries, like the automotive sector, many processes in the production and supply of pharma products are still analogue. The use of fax machines, for example, is still very common. However, companies are beginning to embrace the importance of the digitalization and automation of processes to enhance global patient care and maintain their profitability. In his list of market trends and opportunities in Health Tech, Sander Willems, Senior Director Supply Chain Management at Philips Healthcare, summed up that a “Shift to value-based healthcare will reduce waste, increase access and improve outcomes”. To me, this is a strategic starting point to make supply chains more stable and to fill the gaps. Moreover, technology helps the operative processes to become resilient, efficient and keep the patient at the center of every action. Digitalization can help speed up critical processes and provide the necessary transparency required to monitor the often-times sensitive materials moving along the value chain. All-in-all this was a very informative event, and I look forward to seeing you there next year!